Vilma and Roderick admitted that they had a spat that lasted for a year during their guesting on Magandang Buhay. 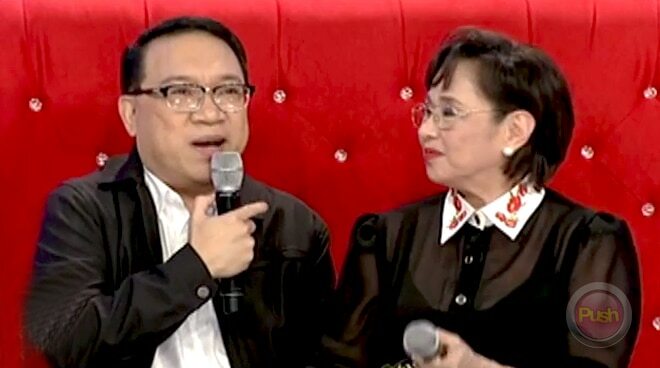 Longtime friends Vilma Santos and Roderick Paulate admitted that they had a spat that lasted for a year during their guesting on Magandang Buhay on Thursday, October 26. "Meron kaming promo ng isang movie. Nagkamali 'yung tugtog... Pagkamali 'yung tugtog, na-upset 'yung partner natin, di ba? Alam ko parang naselos 'yung Vilmanians eh kasi parang feeling nila kinampihan ko si..." Roderick began to recall. "Hindi, sa madaling salita no'n, si Maria (Maricel) pa no'n," Vilma squeezed in, saying that there was a time when Roderick sided with Maricel more. "Kinonfront ko siya. Sino ba talaga 'yung gusto mo? Talagang nagsigawan kaming dalawa. 'Bakit ganyan ba? Napaka-insecure mo? Ganito lang naman 'yun.' 'Hindi ako naniniwala sa'yo,'" she narrated, adding that they did not speak with each other for more than a year. Roderick then said that the spat really made him realize that Vilma is truly his friend. Sharing how he reached out to her, Roderick said that he stayed inside a box for three hours just to surprise Vilma on her birthday. "Dinala 'yung box 'dun sa Araneta (Coliseum) tapos sabi ni Vi, 'ano ito?' Binuksan. Ako na nga 'yung lumabas." The seasoned actor and TV host then sang "Nothing's Gonna Change My Love For You" which made the 'Star for All Seasons' cry. Roderick said that he apologized a second time to Vilma in her dressing room after the show.